Sloty Casino was established in 2017 and is owned and operated by a company known as Genesis Global Limited. Genesis Global Limited is known for its exceptional online casino products and Sloty is one of their best yet. Sloty casino is especially great for South African players given that it directly supports South African Rands for both deposits and withdrawals without the need for any currency conversion. Sloty casino is licensed by the UK Gambling Association and also Malta Gaming Authority. In terms of legitimacy and fairness, Slotycasino is as transparent as it can get. They use a random number generator which essentially makes every roll of the dice, or every spin of the reel as random and unpredictable just like in real life. Therefore, when you play at Sloty casino you can rest assured that the results or outcome is not rigged to give the house the edge in any way or form. New players have the opportunity to claim a generous welcome bonus of up to R22,500 spread over the first four deposits in addition to 300 free spins. There is no download version of Sloty casino. Contrary to what you may be thinking, this is actually a good thing. This way, you do not have to download any software or application onto your desktop or mobile phone in order to play Sloty casino games and so you are free from the risk of virus or malware infestation. The desktop and the mobile casino is instant play, just open your browser, go to Sloty.com and get started playing within the browser itself in a matter of seconds. The mobile casino supports both smart phone and tablet devices, be it iOS devices, Android devices or Windows mobile devices. The mobile casino features an incredible 230 games and counting as of the time of writing. Sloty casino offers a great range of online casino games from some of the best online game suppliers in the industry. Slotycasino is powered by NetEnt, Evolution Gaming, Play N’ Go, Quickspin. There are currently over 390+ games in the desktop version of Sloty Casino and 230 mobile games. The types of games on offer include slots (classic slots, video slots, etc. ), roulette games, blackjack games, poker games, sic bo, scratch cards, live casino games, and much more. The website is designed intuitively and is very easy to navigate through. There is a live dealer casino section at Sloty casino where you can experience the thrill of playing against a live dealer just as if you were seated at a casino table in Las Vegas. The live streaming is seamless and in crystal clear high definition quality. The welcome bonus on offer for new users at Sloty casino is easily among the best you will find in the entire industry. If you play your cards right and make your first four deposits in a way which will exploit the welcome bonus to its maximum potential, you stand to make as much as a whopping R22,500 free exclusively from the welcome bonus itself. If that is not enough, you should know that the welcome bonus also offers 300 free spins upon your first deposit. Albeit, these spins are not issued all at once. Instead, they are issued at the rate of ten free spins per day for ten consecutive days from the day you make your first deposit. These free spins will be credited to your account at 12:00 GMT everyday and are valid for a period of 24 hours from the time they are issued. These free spins can be used on some of the best titles that Sloty casino houses which includes Starburst, Gonzo's Quest, Red Riding Hood or Aloha! Cluster pays. On your1st deposit, you will receive a 100% match bonus where whatever you deposit as your first deposit, 100% of that amount will be additionally credited to your account as bonus from the side of Sloty casino. However, this is limited to a maximum of R4,500. To qualify for this deposit bonus, you need to make a deposit of at least R300. On your 2nd deposit, you are given a match bonus of 50% up to a limit of R6000 and the coupon code for this is WSLOTY2. The rewards continue with your 3rd and 4th deposit as well. You will receive match bonuses of up to 25% on your 3rd and 4th deposit and the limit is now raised to a maximum of R6,500. In order to avail the 3rd and 4th deposit welcome bonus, you will be required to use to coupon codes WLSOTY3 and WSLOTY4 respectively. Please note that in order to withdraw your welcome bonus, you will first have to meet the wagering requirement of 40x. There isn’t a no deposit bonus at Sloty casino. When it comes to online casinos, customer support is crucial. People dealing with banking and transactions tend to be especially apprehensive and want to be able to reach out to support quickly if need be. At Sloty casino, they understand this and offer easy to reach customer support options which includes live chat support, E – mail support and also an international hotline that you can call on. The live chat support is really great, the executive is just a click away and their responses are always timely, helpful and professional. Furthermore, there is an extensive FAQ section on the website which explains in good detail answers to some of the most common questions and queries users may have. If you go through this, then you might not have to contact support at all and can get the resolution you want readily available right at the FAQ section. Payments and withdrawals at Sloty casino are supported in the following currencies - ZAR, USD, NOK, CAD, EUR, SEK. Deposit methods include Visa and Mastercard credit cards, debit cards such as Visa and Maestro, e wallets like Skrill, Netller and EcoPayz and an e voucher called paysafecard. They also support a pre-paid virtual card which is entropay. Players can cash out winnings via an array of withdrawal methods that include Visa Credit Card, Visa Debit Card, Mastercard Credit Card, Neteller, Skrill, Online Bank Transfer and ecopayz. Withdrawals to eWallets can take up to 24 hours to complete while requests for wire transfers are processed and completed in around 5 to 7 days. The time frame for cashing out to credit cards is around 4-5 business days. 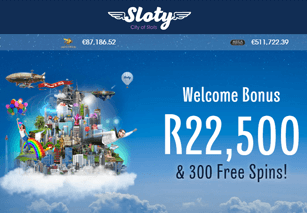 Sloty Casino is ideal for South African players. There is really nothing to complaint about at this casino. They have got all aspects on point. Be it game collection and variety, mobile support, hassle free banking, reliable customer support and state of the art cyber security measures. If you are considering signing up, then you need not think twice!